Ronan was an online sensation this year, with 1.3 million clicks and counting on YouTube. 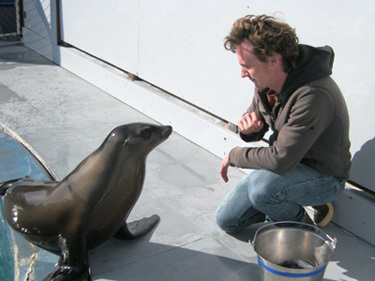 It was a year of advancing knowledge and challenging the status quo at UCSC: a boogie-woogie pinniped named Ronan proved that sea lions have the beat, the sciences and humanities converged in bold new ways, the campus launched an unprecedented $300 million campaign and bestowed its 100,000th academic degree, and researchers opened up a new front in the high-tech cancer war. The total number of degrees conferred to UCSC undergraduate and graduate students passed the 100,000 mark this spring -- an extraordinary milestone for a campus that will turn 50 years old in 2015. The first of those degrees were awarded in 1966. • Emily Brodsky, a professor of Earth and planetary sciences at UC Santa Cruz, helped organize the Japan Trench Fast Drilling Project (JFAST), which successfully drilled across the Tohoku earthquake fault last year and installed a borehole observatory nearly 7 kilometers beneath the ocean surface, helping reveal the secrets of a devastating natural disaster. • UCSC scientists opened up a new front in the cancer wars. The Pan-Cancer Initiative, launched at UCSC, has yielded an abundance of findings that could open up new treatment options. • On a much more lighthearted note, Ronan that irresistible, head-bobbing sea lion proved that pinnipeds have an enviable sense of rhythm. Scientists at the Long Marine Laboratory trained Ronan to bob her head in time with rhythmic sounds. Ronan then showed that she could keep time to some truly funky music, most notably a song by Earth, Wind and Fire. • Researchers also gained a greater understanding of animals that lived long ago, and what they share in common with animals today. Beth Shapiro and Ed Green of UCSC’s Paleogenomics Lab at UCSC used ancient DNA extracted from fossils to study evolution. This year they sequenced the genome of a horse that lived 700,000 years ago, and found intriguing evidence that polar and brown bears mated at the end of the last ice age, eventually transforming a local polar bear population into a group of brown bears. • A young puma called 39M was safety captured near downtown Santa Cruz and resettled in the nearby Santa Cruz Mountains with help from UCSC researchers, who have been studying habitat fragmentation in mountain lion country. The team worked in close cooperation with the police, the California Department of Fish and Wildlife, and other agencies and organizations. Postscript: 39M was struck and killed on Highway 17 around Vine Hill Road in October. • Planning is now underway for the Institute of the Arts and Sciences—part museum, part teaching/research facility, performance center, and meeting space, complete with study areas, a café, and the kind of jaw-dropping Monterey Bay views that could make it hard to focus on your lunch. • Plans for the project were revealed close on the heels of an announcement that Rowland and Patricia Rebele had given a million-dollar gift to launch the project. • This fall, UCSC's Institute of the Arts and Sciences presented the campus’s inaugural LASER event, hosting an evening of speakers who will lay the foundation for a new UCSC series by speaking about the exciting places where arts and sciences converge. • UCSC launched a $300 million fundraising campaign this year to support students, research activities, other academic programs, and campus facilities. • UC Santa Cruz alumnus Rick Carter won an Oscar Sunday, February 24, for production design on Steven Spielberg’s acclaimed film, Lincoln. This marks the second academy award for the former UCSC art major. • UCSC alumna Bridgette Auger’s ongoing work with Syrian refugees was featured as “The Toll of Syria’s War” on the CBS News web site. Auger’s project documents the lives of two Syrian men now living outside their home country. • The popular Community Studies major is accepting undergrads and back in action at UCSC after being reinstated. • UCSC announced a $500,000 gift from the Helen Diller Family to support the campus’s Jewish Studies Program. • The first-ever UCSC “ED Talks” – following the format of the extremely popular TED Talks lectures – were a success this year, drawing an audience of 250 to hear presentations by David Haussler, professor of biomolecular engineering; Terrie Williams, professor of ecology and evolutionary biology; and Alan Christy, professor of history. • A $5 million gift from Alec and Claudia Webster of the Helen and Will Webster Foundation will allow for the “reinvention” of the historic Hay Barn on campus as a new home for many of UCSC's innovative environmental sustainability programs. • Banana Slugs continued to demonstrate their skills as leaders and community builders. The recent selection of Karina Cervantez (Kresge, '03, psychology) as Watsonville's mayor means UC Santa Cruz graduates hold the top municipal seats in Santa Cruz County's two largest cities. • Visiting luminaries shared important insights this year, from the irrepressible theater and opera director Peter Sellars talking about creativity and compassion during the Maitra Lecture to the legendary architect Frank Gehry chatting with architecture writer Paul Goldberger about bold, risk-taking artistic expression, and a sense of “serious play” during the UCSC Foundation Forum. Both were signature events of the UCSC Founders Celebration. • This year the White House took notice of UCSC, and more than once. The work of two of our distinguished faculty members was honored--Sandra Faber with the National Medal of Science for her work in astronomy, and David Haussler for his role in launching a new international genomics alliance. Also at the White House this year: an alumnus and a current student joined President Obama in the Oval Office as he signed an historic bill that cuts student loan interest rates. Another alum helped lobby for the bill days before it passed.